Air travel has become more challenging in recent years, so preparing for a visit to the airport these days is key. Getting ready will make the entire experience far more enjoyable -- if you've packed for airport security, have the right travel documents, and know what to expect, you'll experience less stress, get to your gate faster, and kick off your trip with a smile. Let's walk through our eight greatest tips for airport travel. Trying to get the best airfare can be tension-inducing: how do you know if you really got the best airfare deal possible? Have you looked at every one of the nine million sources out there? Is now the best time to buy your ticket? Should you wait or lock down the current price? I recommend starting by browsing student airfare websites, comparing the price you get it to regular airfares using an airfare aggregator, such as Skyscanner and then going for it. It's also worth checking if you're entitled to student travel discounts, as that can often save you a serious chunk of change on your flights. Research is key here, and the more you can dedicate to hunting down inexpensive fares, the better. On top of that, if you can be flexible with your dates and times, you're far more likely to score a cheaper deal. Keep your options open, look around, and you'll be more likely to snag a bargain. This part is simple: after you buy your flight, you'll be emailed a booking confirmation and your ticket. This is one of the few travel documents you'll want to make sure you have to hand before heading to the airport. Some budget airlines, usually in Europe, will require you print this out before you check in (charging a hefty fine if you forget), but this is thankfully rare. For most airlines, you'll be able to show your ticket on your phone or laptop to the check-in staff, if at all. Over the past five years of full-time travel, taking hundreds of flights, I've had to do this maybe five times. I usually just hand over my passport and that's all that's needed to check my bags. If you're a carry-on traveler, you can load your boarding pass on your phone before you arrive to the airport, then head straight through security without having to visit the check-in desks first. This is one of the least stressful ways to travel through an airport, so I highly recommend trying to see if you can minimize your luggage to fit in a smaller bag. I recommend making sure your phone or laptop is charged before you head to the airport, just in case you do need to show your ticket in order to check in. You will always need identification at the airport, both when coming and going. You will almost always need a passport unless you're flying domestically. You'll also probably need a travel visa (you may be given a blank form on the plane). You will seldom need, but may want to carry, travel immunization records. You may want, but *may* not need if you are renting a car at an airport abroad, an international driver's license. Getting a good seat on a short flight isn't completely crucial, but can definitely make flying more comfortable. The right seat can make a long flight, like to New Zealand, much better, however. As soon as possible (while buying your ticket if you're likely to forget), choose a seat you want, like an aisle so you can stretch, or a window so you can sleep with your head against a wall. Seatguru is a useful website to check before booking, as it provides seat maps and diagrams for every plane you're likely to come up against, rating each seat so you can choose the best available. Did you know, for example, that there are often several seats on a flight that have power sockets for charging? That can make a huge difference to the quality of a long-haul flight if you can charge your laptop while you're up in the air. Airport rules have changed substantially since your parents were in your traveling shoes. Today, you'll have to remove your shoes off to get through airport security; believe it or not, you used to be able to arrive at the airport with seconds to spare and sprint onto a flight with just a ticket in hand, which might not have even been checked. 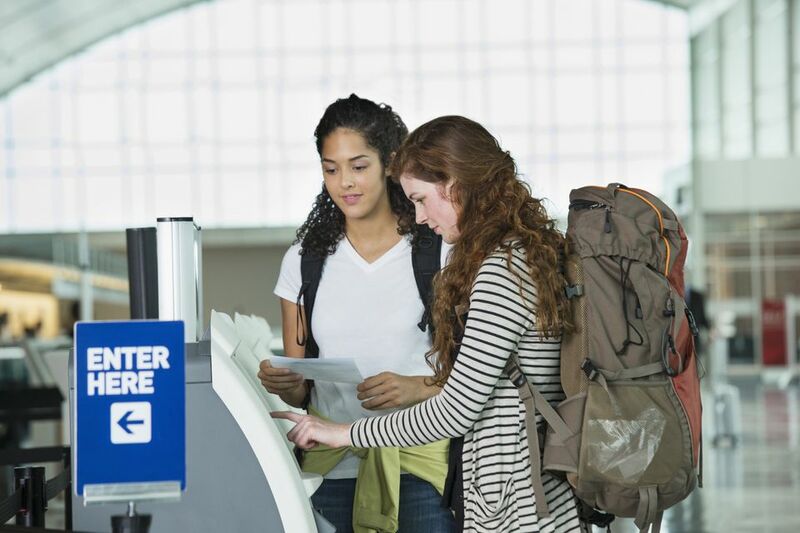 Before you leave, make sure to read up on airport rules before you go -- like way before you go -- so that you don't receive any nasty surprises when you arrive. If you've read up on airport rules, you know that the U.S., U.K. and Europe have implemented super-strict rules regarding what you may carry on to a plane and through airport security. It won't be painless, but it's possible to pack for airport security, if you make sure you carry the right bags and attitude. Remember: you won't be able to pass through security with liquids or gels in containers larger than 100 ml, and you'll need to remove your electronics to pass them through the scanner separately. I recommend taking as small a bag as possible, and putting any liquids or gels into a small plastic bag while you're packing. It's also worth putting all of your electronics into the same compartment of your bag, so they're within easy reach. Wear shoes that are easy to slip on and off, and make sure you're not carrying anything in your pockets. Want to bring tequila or local salsa home from Mexico? Bought a samurai sword somewhere? You'll have to transport it in a checked bag, which vastly increases the chance that you may lose said bag somewhere along the way. Lost luggage happens, especially now that TSA rules practically dictate having to check bags for some travelers, but you can learn how to avoid losing your bags in transit and what to do if it happens to you. Thankfully, this occurrence is pretty rare, so it's not really something you need to worry about before you even head to the airport. Just make sure you read up about it so that you know what to do if it does happen. The actual flying process is often cramped, uncomfortable, and stressful. Fortunately, there are a few things you can do to minimize the chances of all three. Load your laptop or tablet up with movies and TV shows before you leave. Flying isn't known for being particularly exciting, so you'll want plenty to keep you entertained. If you're going to be flying on a budget airline, you likely won't have screens on the back of your seat, so this is something to prioritize if you hate feeling bored. Bring a guidebook with you. If you're anything like me, you often turn up at a new destination without having done much research. Use your time on the plane to find out more about the must-see sites and get yourself excited to land. I recommend Lonely Planet guidebooks, as they're full of helpful information, focus mostly on budget travel, and look great stacked up on a bookshelf. Buy a travel eye-mask in preparation, especially if you'll be taking an overnight flight. This pair receives great reviews on Amazon and work exceptionally well at blocking out the light. Pack a small overnight kit for the flight that contains toiletries to help you freshen up. I always travel with my toothbrush and a small tube of toothpaste. I also bring a facial mist, a small tube of moisturizer, and a hairbrush. You won't believe how much these small additions help wake me up after an overnight flight! If you're going to be crossing several timezones, you absolutely need to purchase some No-Jetlag pills. They're worth the investment if you're prone to suffering from jet-lag in a bad way, as they'll help you adjust faster to your new timezone, so you can make the most of your trip without napping your afternoons away.